We absolutely love these books, and we make no apologies for playing favourites. We had somehow missed "Very Little Sleeping Beauty" in the flurry of book releases last year, but we couldn't wait to play catch-up with VLSB and the latest Very Little Princess, "Very Little Rapunzel". Let's start with a not-so-snoozy little madam who is about to celebrate her birthday. But while being tucked up in bed by her daddy, Very Little Sleeping Beauty is anything but tired. She needs a goodnight song (or three), some stories of course, perhaps a drinky (in her special cup) and a teddy or five. But when Daddy takes way too long getting Very Little Sleeping Beauty's favouritest cup, it's time for SB to go and investigate! Aunty Fairy also lives in the castle, and can't wait to show SB what she's got for her birthday - but there's a bit of an accident (any parents who have ever steered their kids round fragile objects in museums or National Trust properties may wince at this bit) an argument and lots of tears. Can Mummy and Daddy somehow sort things out before the party? Once again there's some brilliantly wry observations of child and parent behaviour tucked in between the pages of those oh-so-cute and hilarious story. 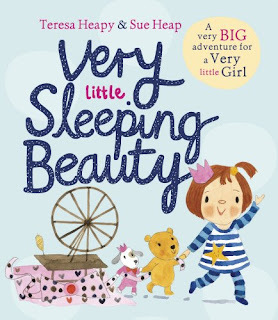 We always read these books, alternating between me reading the 'grown up' bits, and Charlotte reading the "Very Little" lines - and it amused me to note the difference in her voice between now and when we first encountered these fantastic little books. Charlotte's best bit: Poor daddy hunting for Very Little Sleeping Beauty's special cup (can you spot it in the picture? Daddy's favourite bit: Any parent who has ever spent rather too much time in the evenings trying to get their little ones to settle will absolutely love this hilarious tale! Very Little Rapunzel has lovely long luxurious hair. The problem is, as lovely as her hair seems, poor Mummy is at her wits end - spending endless hours combing, brushing, attempting different styles but always ending up in a complete tangle...! 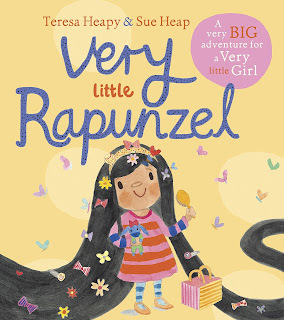 Mummy pleads with Very Little Rapunzel to be allowed to take her to the hairdressers, but after a trantrum VLR throws all the hair things out of the window! A passing Very Little Prince spots the things, and tries to return them. Once Rapunzel lets down her long locks, the prince can clamber up and they can have a fantastic playdate. But what happens quite often when kids get together, and bump heads? NITS! Nasty itchy nits, and with everyone scratching it seems like Mum's work has only just begun. Combing (imagine combing Very Little Rapunzel's locks with a tiny nit comb) washing and combing again. VLR takes it on herself to solve the problem once and for all. No hair, no nits! So she takes a pair of scissors to her locks! EEK! But how will the Very Little Prince get home from the tall tower with no hair to climb down? Time for a cunning plan! Charlotte's best bit: Mummy's fantastic idea on how to get the Prince back down to the ground! Daddy's favourite bit: Again, just so brilliantly observed, funny and cute! Don't miss "Very Little Cinderella" - complete the set!! 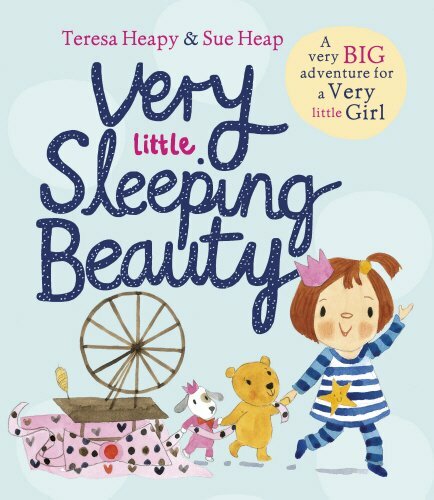 "Very Little Sleeping Beauty" and "Very Little Rapunzel" by Teresa Heapy and Sue Heap are both out now, published by Red Fox Picture Books.